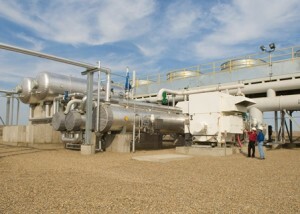 Basin Electric Power Cooperative’s St. Anthony Heat Recovery Project. Photo courtesy of Basin Electric. Recovered energy generation (REG), also known as heat-recovery generation or waste heat energy, is a process of capturing hot exhaust to drive a turbine and create electricity. Montana-Dakota Utilities owns a heat-recovery generation station near Glen Ullin, N.D., which generations 5.3 megawatts. Basin Electric purchases the electricity from three recovered energy generation sites in North Dakota. Those sites produce 16.5 megawatts of electricity using exhaust from the Northern Border Pipeline. Each of the three sites – Manning, St. Anthony and Zeeland – produce 5.5 megawatts of electricity. Read more about Basin Electric’s Recovered Energy Generation on their webpage here. A subsidiary of Ormat Technologies developed the recovered energy generation projects from which Basin Electric buys power. They are the first use of this technology on a natural gas pipeline in the United States. The Northern Border Pipeline is a natural gas transportation system of 1,398 miles that links the Midwest with reserves in Canada.